Paddle Parade (originally known as Penguin Shuffle) is a microgame found in the Nature folder in WarioWare, Inc.: Mega Microgame$!, and returning as one of Mona's microgames in WarioWare Gold. 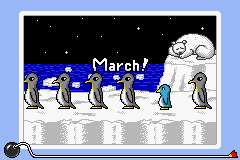 The objective of the microgame is to make the baby penguin walk in unison with the other penguins without bumping into any of them (or their bumping into the baby penguin). In WarioWare Gold, the player instead takes control of a yellow duckling swimming over a lake among other brown- and white-feathered ducklings. 1st level difficulty: The penguins/ducklings take a brief pause before moving left. 2nd level difficulty: The penguins take a brief pause before moving left, then stop moving. 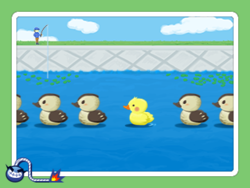 In WarioWare Gold, rather than stopping, the ducklings take a brief pause before continuing to move left again. 3rd level difficulty: The penguins/ducklings take a brief pause before moving left, then take another brief pause before moving right. This page was last edited on April 4, 2019, at 00:18.